Novelist Martin Limón lives quietly near Seattle. In his imagination, however, he’s often traveling to South Korea, where his series of military thrillers starring Sergeant George Sueño are set. 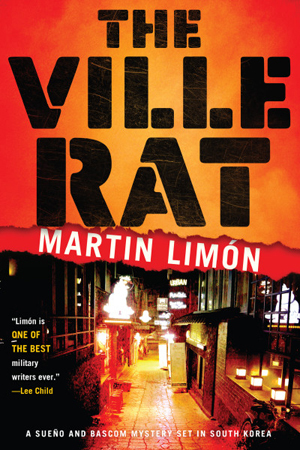 The newest series title, “The Ville Rat,” set in the 1970s, follows Sueño and his trusty sidekick, Sergeant Ernie Bascom, as they juggle the murder of a Korean lady, a military shooting requiring a military trial, and an ever-deepening dark pool of corruption and intrigue. Roots of Japanese colonization of Korea began in the late 19th century with foreign invasions and ended with Japan’s World War II defeat. In 1945, Korea was divided into north and south along its 38th parallel north. Two separate governments were established, both claiming legitimacy. South Korea’s turbulent modern history included U.S. military administration in the immediate post-war period, the establishment of the Republic of Korea, growing antagonism with North Korea, and military rule. Limón’s first stint in South Korea in the last 1960s occurred during its Third Republic period, one characterized by the beginnings of economic and technological growth. It was during this time that South Korea transitioned from an agrarian society to an industrialized one. Asked about the major misunderstandings between American about Korean culture, Limón invoked history. In 1910, Japan annexed Korea (although Korea did not agree on the legality of the Japan–Korea Annexation Treaty, as its emperor did not sign it), and Japan controlled Korea until Japan’s surrender to Allied Forces in World War II. Under the 35 years of Japanese rule, Japan repressed Korean traditions and cultures. Pro-independence rallies that took place in the early 20th century were quashed by Japanese law enforcement, with thousands of Koreans killed by Japanese soldiers and police.